In normal situations of direct influence, we have nowhere to go but to be affected by reality. We are all affected by what we choose to live by. What we create into the world affects us back. We all get hit by the general aggregate consequences of the behaviors we live by. Do right, get right. Do wrong, get wrong. We act, and receive the result. Truth or Consequence. Be Right or Go Wrong. 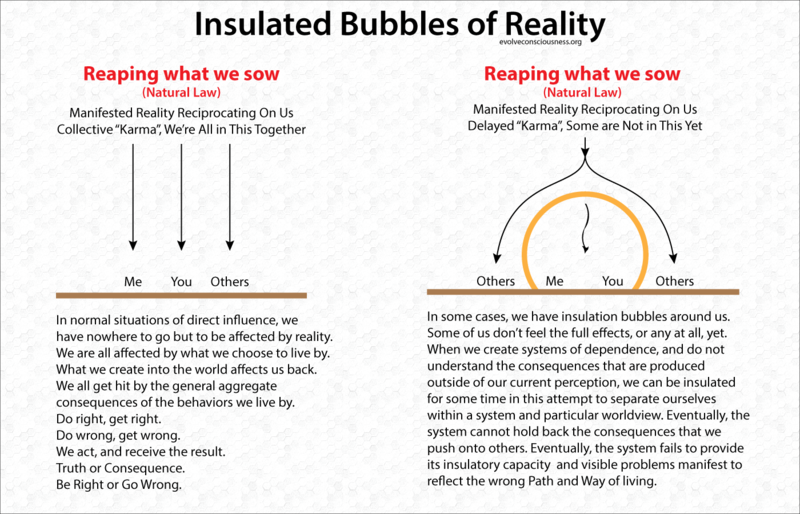 In some cases, we have insulation bubbles around us. Some of us don’t feel the full effects, or any at all, yet. When we create systems of dependence, and do not understand the consequences that are produced outside of our current perception, we can be insulated for some time in this attempt to separate ourselves within a system and particular worldview. Eventually, the system cannot hold back the consequences that we push onto others. Eventually, the system fails to provide its insulatory capacity and visible problems manifest to reflect the wrong Path and Way of living.